Domestic adoptions are adoptions handled in accordance with the laws of a State in the United States. Each state has its own adoption laws that govern how an adoptive and birth family locate each other, the amount of living expenses that can be paid (if any), the consent process and revocation periods and enforceability of post-adoption contact agreements. This is why you’ll need an experienced and knowledgeable adoption attorney to handle the complex legal processes of your U.S. adoption. A domestic adoption can be handled by an agency, or it can be a private adoption (also called independent adoption or parental placement). All three local jurisdictions (D.C., Maryland and Virginia) allow for both agency and private adoptions. However, regardless of whether you choose agency or independent adoption, private or foster care adoption, you’ll still need to work with an adoption attorney to complete the legal steps of adoption in every state. The Family Formation Law Offices can complete every type of domestic adoption for hopeful parents in DC, MD or VA. Contact us now to begin your adoption journey, or read on for more information about domestic adoptions. There are two main types of domestic agency adoption: private agency adoption and public agency adoption (foster care adoption). Both are domestic agency adoptions because they involve the adoption of children within the United States and are handled by an adoption agency. Private agency adoptions involve infants who are placed for adoption voluntarily by their biological parents. An expectant parent will contact an agency seeking adoptive parents for their unborn child, and will remain involved in the process of placing their child for adoption, issuing their consent after the birth of the child in accordance with the adoption consent laws of their state. Public agency adoptions involve the adoption of older children and babies through the foster care system. These children have typically been removed from their biological family due to allegations of abuse or neglect. While most children in foster care will ultimately be reunited with their biological family, if their parents are unable to complete the court-mandated steps to regain custody, the court will terminate their parental rights. Then that child will become eligible for adoption from the public agency. In addition to these types of agency adoption, there is a third option for parents interested in domestic adoption: independent adoption. Independent adoptions involve the private placement of children (usually infants) without the involvement of an adoption agency. In an independent adoption, prospective birth parents and adoptive parents find each other on their own through private networking or advertising, working closely with their adoption attorney to legally complete the process after finding a match. 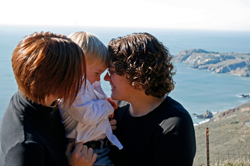 Jennifer and Catelyn are able to help you complete all of these types of domestic adoption. Contact us now to learn more. Who Might Choose a Domestic Adoption in the U.S.? There are many different ways to welcome children into your family. We can discuss your options with you so that you know you’re choosing the right family-building option for you. The increased likelihood of being able to adopt infants as well as older children. Wanting to adopt a child from within the United States. Preferring the increased likelihood of a more open adoption with their child’s birth family. How Family Formation Law Offices Can Help with Your Domestic Adoption in VA, MD and D.C.
For families pursuing U.S. adoptions, Jennifer and Catelyn will advise clients on their legal rights and responsibilities and will provide an overview of the entire process, including the home study process and the differences between private agency adoption, public agency adoption and independent adoption. We advise our clients on avenues through which to locate birth families, as well as the pitfalls and precautions to take when looking for a prospective birth family. We work with clients at all stages of the process, offering services from initial consultations to assistance finding an adoption opportunity, guidance through legal issues, finalization procedures and ICPC. We are retained at various stages of the process to assist clients based on their needs at the time. Jennifer and Catelyn also represent expectant parents who are considering placing their child for adoption. We work with clients from an initial consultation, where we can help to work through the adoption plan, provide guidance on how to locate adoptive parents and ensure the prospective birth parents’ rights are safeguarded. Birth parents are provided with the support and guidance necessary to assist them in the adoption process through the consent process and negotiation of a post-adoption contact agreement. The adoption processes, costs, wait time and more will all vary depending on the type of domestic adoption that you choose, as well as your individual circumstances. Your first step should be to schedule a consultation with us to review all of your options. In this consultation, you’ll discuss the different types of adoption and ART that you could potentially pursue, all of which we can help you complete, so that you know for sure which path to parenthood is the right one for you. If you confirm that adoption is the way you want to become a parent, we will give you a home study referral so you can begin that process, and then you’ll set up a second meeting to discuss the different ways to find a child to adopt, including adoption agency referrals of professionals whom she trusts to help you find your child. Jennifer and Catelyn personally review everything in order to give you individual advice and support. Our years of experience will help you to put your best foot forward throughout your domestic adoption journey. Contact us now to learn how to begin the domestic adoption process today.